Oh, I still continue to see the things that "could've been better" or "should've been done" or "would have been smoother if". And yes, I continue to feel my palms sweat and my heart pulsate much to the dismay of my rising stress levels. Yes, I do continue to feel anxiety. My month long vacation has not entirely turned me into a totally new person. However, I cannot deny that the breather did help in cleaning out my cluttered thoughts so I can be gathered back into a certain semblance of wholeness. I have begun to see that there is something about gratitude that whispers the truth about a life lived graceful and faithfully pursuing peace. Gratitude gives you a graceful posture that helps you remain flexible when things do not happen the way you would have wanted them to. Gratitude helps you see that in every moment God is at work even if the circumstances do not entirely manifest the outcome you desire. Gratitude affirms that all things indeed work for the better even when it starts off conflicting, heavy and stressful. Gratitude gives birth to a new way of seeing the moment and makes you stand awakened to the miracles you might have easily missed out had you chosen to grumble or complain. But it hasn't been easy to arrive at this. It is not easy to let go of a perspective where everything has to be streamlined and perfect. It is not easy to let go of a mindset where self-reliance is a mark of good character and self-surrender is a mark of weakness. How do you live when you know this to be true and yet not everybody believes with you? How do you struggle with keeping at it when the whole time you try to rise above the cynicism, the doubt or the complaints you hear people surrounding you continue to do so? This remains a very real struggle and I saw my friends eyes and how she wrestled to live this life the same as mine. I saw how worn out she has been and how despite the passion she's put into her service, she is simply confused with where she's at. I look at her gently and let her cry. She said she hasn't felt this weak in a long time. Her weakness has been listed out for her and enumerated in standards she no longer knows she can comply. I smile and pull out a book I've been reading for a couple of days now and said, "God be praised for your weaknesses for without them then you will have no need for Him!" And she laughed. I think it was the first time I heard her laugh at herself for being in this situation. I suppose this is what it means to be graceful. When you're already down and out. Tired and beaten. Instead of having to "toughen yourself up" like the world tells you to, you just smile and laugh and release. Slowly the peace flooded in and we laughed. 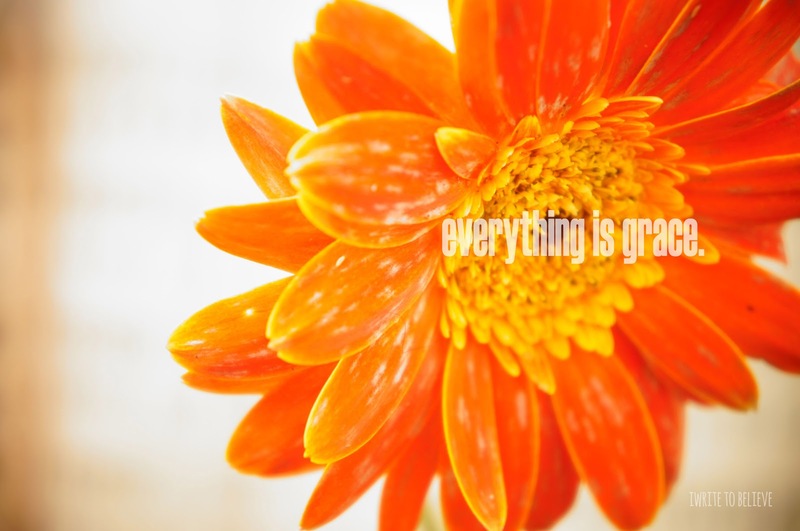 Everything is indeed grace. She is careful to make it clear that her trust is not based on herself, her desires, her qualities or her virtues but only on God. Sometimes we manage to do what is right, lead a good and virtuous life, have great trust in God, without the slightest problem; and then a difficult time comes. For instance, we commit a fault that really humiliates us. Or we make a wrong decision, which is unpleasant, especially when other people notice it. We are brought face-to-face with our defects, and we become sad and discouraged. All our great trust in God melts away like snow in the sun. This simply means that what we called trust in God was in fact trust in ourselves. If trust disappears when we do wrong, it shows that our trust was based on ourselves and our deeds. Discouragement is a clear sign that we've put our trust in ourselves and not at all in God. Trust that is truly based on God whether we're doing well or badly, whether we're happy or unhappy with ourselves, should never waver. God's love is not subject to eclipses. and it is vital that our trust should rest not on our personal achievements but only on God's love, his tenderness, his infinite mercy, on the fact that he is our Father and can never abandon us. Otherwise we will never be truly free but will always be afraid of failure, of our weaknesses and somewhat centered on ourselves instead of centered on God.